work helping improve their communities?” With this thought, he invited leaders of various men’s clubs to Chicago to investigate the possibility of establishing a new association. On June 7, 1917, Melvin Jones joined with about a dozen other civic minded men to give direction to an organization of clubs which emphasized community service as their objective. Most agreed such an orga-nization should be formed, and they further agreed to meet in convention the following October in Dallas to give additional impetus to the proposal. Thus Lionism was born! Nine states were represented at the Dallas convention in October of 1917 — Arkansas, California, Colorado, Illinois, Louisiana, Missouri, Oklahoma, Tennessee, and Texas. The delegates adopted a Constitution and By-Laws and drafted the Objects and the Code of Ethics. Melvin Jones, named Acting Secretary in Chicago, was retained at this post, and Dr. William B. 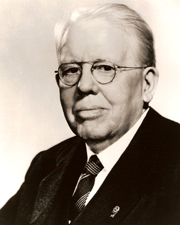 Woods, a surgeon from Evansville, Indiana, was elected the first President of Lions Inter-national. A fresh concept was set in motion at the Chicago meeting and Dallas convention. Community-minded men would direct their efforts to helping people in need, to making their cities, towns, and neighborhoods better places in which to live. How were Lions Clubs initially involved in community services? The United States had entered World War I in April, 1917, and Lions Clubs immediately began to help the war effort. Bond drives and the collection of books and magazines for soldiers were carried out by a number of clubs. Later, the influenza epidemic of 1918 spurred many Lions Clubs to cooperate with hospitals and health officials in a variety of capacities. Lions International entered the 1920’s with a spirit of confidence and energy. By the end of the decade, Lions Clubs were organized in every state of the union at that time, in Mexico, in China, and in almost every province in Canada, making the Association truly international. Membership stood at nearly 80,000 and club strength at over 2,200. Perhaps the most important development for Lionism during this decade, however, occurred at the 1925 International Convention in Cedar Point, Ohio. The convention delegates accepted the challenge of Helen Keller to “Become Knights of the Blind,” and Lions International soon became one of the world’s leading organizations in the fight against blindness. Eye research facilities, eye banks, dog guide schools, assistance to the blind and a multitude of other programs have made Lionism and sight conservation practically synonymous. As the Association entered the 1930’s, its strength was well established. Lionism, as a result, did not succumb to the tragic effects of the Great Depression. The Association was financially in the red in 1934, but the 2,600 clubs of Lions International (many whose finances were totally depleted) still conducted 19,300 community service projects. The spirit of Lionism was inde-fatigable. By the end of 1935, financial solvency had returned, and 7,500 new men had donned the lapel pin. In 1935 and 1936, clubs were organized in Central and South America, Costa Rica, Colombia, and Puerto Rico. At the end of the decade, the membership had increased to 117,000; and in 1940, the Association emphasized its international flavor by holding its first convention outside North America—in Havana, Cuba. The outbreak of World War II again threatened the ideals and strength of Lions International. Over 24,000 Lions were in uniform and clubs conducted thousands of homefront service projects, from collecting scrap iron to conducting war bond campaigns. After the war, the Association joined in another idealistic effort—that of securing world peace. Lions International was honored with consultative status at the formative councils of the United Nations. The Association still retains this status on the UN’s Economic and Social Council. In 1948, there were 279,116 Lions and 5,500 clubs in 18 countries, all looking to the future with optimism. Australia became a member nation in 1947, followed a year later by the first two European countries—Sweden and Switzerland. In a very short time, nations in Europe and Asia (which had only a few years earlier been military adversaries) joined in the mutual fellowship and international goodwill of Lionism. In the 1950’s, the motto “We Serve” was officially adopted as tens of thousands of civic-minded men joined Lions Clubs throughout the world. Melvin Jones, the man whose energy and inspiration guided the Association from the beginning, died in 1961. Though often ill in his later years and suffering the effects of severe strokes, he nonetheless appeared almost daily at his office at International Headquarters. Melvin Jones was 82 years of age at the time of his death. He had served Lionism for 44 years. By 1966, membership rose to 800,000 and Lions were active in 20,000 clubs. When the Association celebrated its Golden Anniversary in 1967, the spirit of Lionism had extended to 135 countries and geographical areas. Lions International now prepared to enter another decade, the ‘70’s, one that would witness an amazing growth in numbers and services. A milestone was achieved in 1973 when membership reached the one million mark. During the early 1970s, the Lions International Foundation (LIF) became a potent arm of the Association. Hundreds of thousands of dollars have been disbursed through LIF to aid the less fortunate, to promote sight conversation and to bring long range assistance to victims of natural disasters. Now, more than 1,438,000 Lions in 185 nations and geographical areas are taking part in the entire range of services. Our nearly 43,000 clubs each year carry out any number of projects in the ten major activities of Lionism: Sight Conservation and Work with Blind, Hearing Conservation and Work with the Deaf, Citizenship Services, Educational Services, Environ-mental Services Public Services, Recreational Services, Health Services, International Under-standing and Cooperation, and Youth Exchange and Social Services. Lions also sponsor the world's most successful drug awareness program. Lionism’s history has witnessed the triumph of an idea—the fervent belief that pubic-spirited people can and will give of themselves to unselfishly serve their communities and help people in need.